The Kenwood DG-5 external digital display provides 100 Hz accuracy to your TS-520S. There is a dimmer switch on the rear panel. 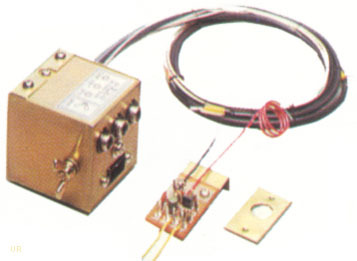 The DG-5 can also be used as a conventional frequency counter from 100 Hz to 40 MHz. Gate time is 0.1 seconds. Maximum input voltage is 200 VDC (DC + Peak), 5 V rms. The "DH" button on the front is for Display Hold. Pressing this button will store the current frequency tuned, irrespective of subsequent frequency changes of the radio. This allows the return to the original channel as the DG-5 serves as a frequency memory. The DG-5 may be simply connected to your TS-520S via three cables to the back of the radio. If you own the earlier TS-520, then the DK-520 kit (sold separately) must be first installed in your TS-520 prior to the installation of the DG-5. The DG-5 derives its power from the TS-520S or can run directly from 12-16 VDC. Physical: 6.4 x 1.7 x 10.7 inches 2.9 lbs. (167x43x268mm 1.3kg).